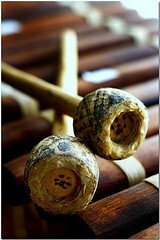 African xylophone instruments exist in many different forms and with lots of names. It can be found in all parts of Africa. Actually, it is even one of the most prominent ethnic musical instruments on the continent. 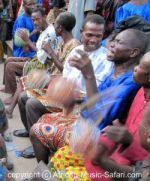 At first, African xylophone music may sound unusual to a Western ear, because the African scales and techniques are different from what we are used to. But it is worth diving into this marvelous world. After all, Western xylophone history includes these African ancestors. Today, this African xylophone also makes a very cool addition to Ghana's neo-traditional music groups. Above four examples just give a taste of the rich variety of the African xylophone. In reality, I could add a long list of other ones played by the many different tribes on the continent.